Personal Profile on the Go — A mobile version of the Personal Profile screen will be available after the release, giving eRA Commons users access on the go. In addition, security has been enhanced for the entire Personal Profile. No Zero for Person Months — A zero can no longer be entered for person months as level of effort in Section D.1 -Participants of the Research Performance Progress Report (RPPR). The zero reflected a time when only whole numbers were allowed, and users were asked to enter a zero if a person month effort for a participant was 0.4 or less. Since decimals are now allowed, the zero is no longer needed. Security Enhanced — Security for eRA Commons has been enhanced to keep up with the latest technological advancements. As part of the transition to the use of the Final Research Performance Progress Report (FRPPR), Section D.1 of Participants is now included. Section D.1 asks “What individuals have worked on the project?” This information will be the list of people who have worked on the project since the previous progress report. It does not include all the individuals during the lifetime of the award. 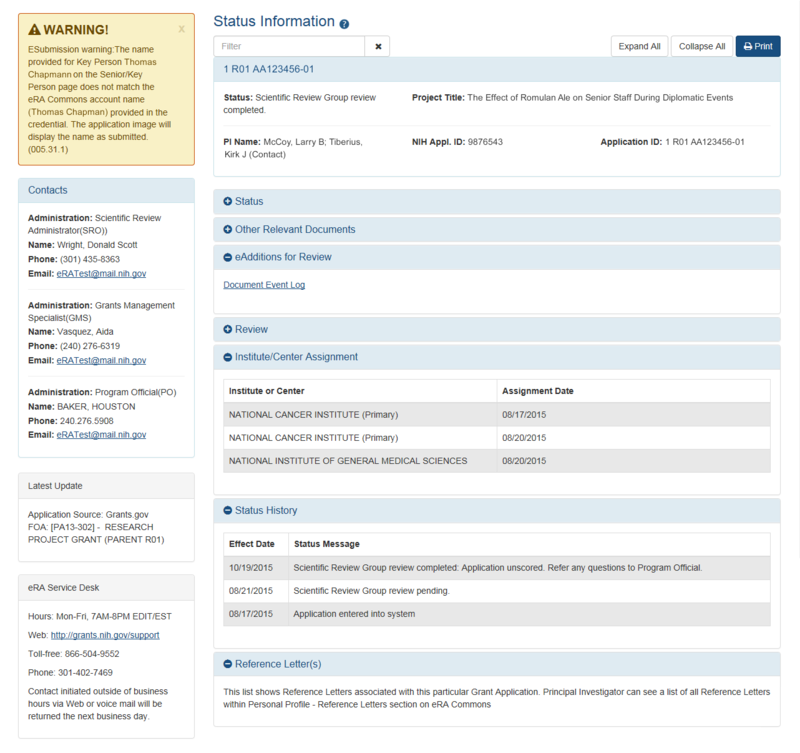 The Status Information screen will have a new look and feel. The screen is an important source of information for Principal Investigators (PIs) and Signing Officials (SOs) for such things as scores, summary statements, NIH contacts, reference letter status, etc. New Status Information screen with some sections expanded, other collapsed. ​NOTE: For small businesses, the new F-RPPR will be in effect at least 2 months later, due to the unique final reporting requirements that they face under the SBIR/STTR policy directive. Accessing IDRs for the Final RPPR is the same process as for annual RPPRs. When the Final RPPR is initiated, users will go to Section G.4.b and click on the Inclusion link. 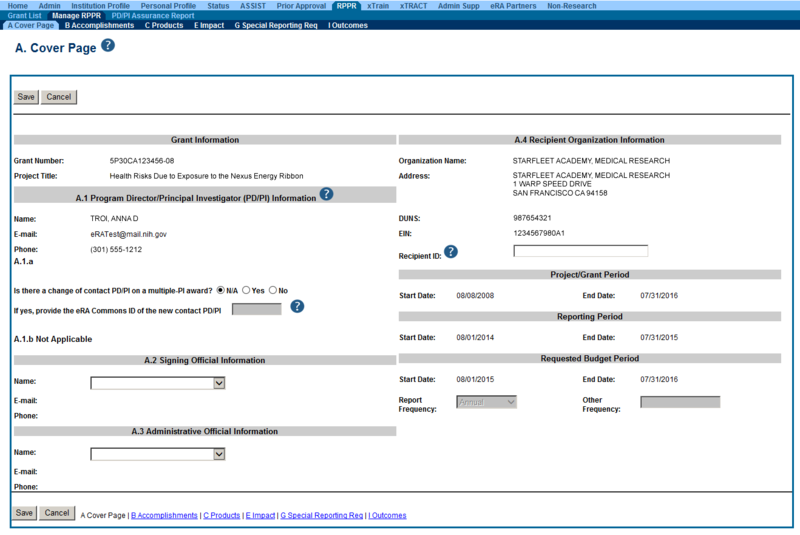 This action takes you to the Inclusion Manage Inclusion Data Records (IDRs)screen. SAMHSA will now use Commons to initiate, track, and manage the progress of non-research amendment applications. This functionality will now be found in the "Manage Post Award Amendments" module under the "Non-Research" tab for eligible users. When a user initiates a non-research amendment in Commons, the system will open up the application, with the appropriate forms, in ASSIST and the completion and submission of the application will happen there. Subsequent to submission, the user will continue to; track the application process; submit, view, and edit "Requests for Additional Materials" (RAM); and view amendments in Commons. As part of the expansion of eRA services to other federal agencies, the Non-Research tab has been added for recipients of SAMHSA (Substance Abuse and Mental Health Services Administration) non-research grants. The new tab is located after eRA Partners. Only those of you who also receive SAMHSA non-research grants will need to access this tab to manage post award amendments. The SAM registration needs to be renewed yearly and is required to successfully submit a federal grant application to Grants.gov. To remove the grant affiliation from the publication with a gold lock, users will need to contact the NIHMS help desk through their web form, which is accessible at http://www.nihms.nih.gov/. eRA Commons' Extramural Trainee Reporting And Career Tracking (xTRACT) system will undergo a maintenance release this Thursday, February 4, 2016. These are just some ofthe features being rolled out for this release; check out the release notes, following the release, for more information on features and fixes. When a training end date is entered in the End Date (when Trainee Left Program) field on the Participating Trainee Detail screen for a participating trainee or student, the subsequent grants for that trainee or student are prepopulated from available NIH sources provided that no subsequent grants were previously entered for that trainee or student for that particular Research Training Dataset (RTD). A new feature in xTRACT for uploading non-NIH funding sources is accessed by clicking the Institution Data tab and clicking on the Upload Funding Sourceshyperlink. Previously the Commons User ID was not always displaying in the Participating Trainees list for a Research Performance Progress Report's (RPPR) RTD. Previously when a Type 2 (competing renewal) grant application had been submitted and its status was Pending Review, the previously awarded Type 5 in the grant family was not appearing in the search results on the Search for Training Grants screen. Consequently, if a user wished to start preparing for a resubmission of the competing renewal, there was no way to do so in xTRACT. The preceding awarded Type 5 grant is now returned in the search results on the Search for Grants screen. If a faculty member or trainee/student received an OTH (Other) type of degree, it is required to enter what type of degree was earned in the Other Degree Text field on various screens in xTRACT. This Other Degree Text was not being displayed where appropriate in the Training table PDF. Previously doctoral degrees were not appearing in the column labeled Doctoral Degree(s) and Year(s) in Table 8C whenever the doctoral degree earned date and the postdoctoral trainee's entry program date were in the same month and year. When performing training grant searches Assistants were not always seeing all of their Principal Investigators (PIs) as expected in their Delegator List in xTRACT. The eRA Commons’ Status screen for PIs has been redesigned with a refined interface, a responsive design and grouping of information that is user friendly. Searches on the Recent/Pending eSubmissions and List of Applications/Grants screens will now provide a total count of applications/grants at the top of the screen. The results will be grouped by Application ID/Grant number and will be expandable and collapsible as needed. Additionally, eRA has updated the look of both the Just in Time (JIT) and Closeout screens for PIs. Both have been reconfigured to improve readability and flow. Both now support “Drag & Drop” functionality to upload files while dynamically validating file size and format. NOTE: Signing Officials will see this same functionality once the redesign of the SO Status Screen is completed later this year. Also a condensed version of the Status screen for PIs is now available for use on mobile devices through a special URL — https://m.era.nih.gov/cmb. See eRA News for more information on this topic. The registration process for eRA Commons will be made less burdensome: Signing Officials will now be able to sign electronically instead of signing a hard copy and faxing the registration form to eRA. Delegates will benefit from new functionality within eRA Commons. If Status is delegated to an person from multiple PIs, the selection of the person for whom they are acting will remain throughout their connection to Commons unless they specifically change the Status setting. When submitting Diversity Admin Supplements (Type 3) applications, all Senior/Key Persons are required to have valid eRA Commons credentials. Failing to provide valid credentials for Senior/Key person will result in the following error message: The eRA Commons Username <Credential> provided for <First Name> <Last Name> is not a recognized eRA Commons Account. This error will result in the application being rejected for further consideration. The eRA Commons Help Desk has been rebranded as the eRA Service Desk. Commons users will see this change on screens, email notifications, web pages, and other resources. The new name reflects the team's expansion to support ASSIST and other eRA services. Institutions will now receive email notifications that Final Invention Statements (FIS) are ready for acceptance by a Signing Official (SO) and submission to agency. eRA Commons will send an initial email after a PI or SO has uploaded an FIS and it is in a status of Awaiting SO Verification. This email will be sent to the Closeout Correspondence email address (as captured in the IPF), as well as the Announcement and Notifications email address (as captured in the IPF). If after 10 days the SO has not submitted the FIS to agency, Commons will send a follow-up reminder email to the Closeout Correspondence email address. eRA has added extra security to the Personal Profile for the Date of Birth and Social Security Number (SSN) fields. These two fields are now only editable if blank or filled with all zeroes. Once populated, the fields will become read-only. NOTE: Should you need to make changes to either of these fields on your Personal Profile, contact the eRA Service Desk for assistance. By notifying NIH of this one-time extension of the period of performance, you certify that the extension is not: 1) being exercised merely for the purpose of using unobligated balance; 2) prohibited by the terms and conditions of the Federal award; 3) requesting additional Federal funds. Further, it does not involve any change in the approved objectives or scope of the project. Selecting the checkbox enables the Confirm button for submitting the request. You must select the checkbox to confirm. The xTRACT module will be available via the eRA Commons (See Overview). It will allow applicants, grantees, and assistants to create research training tables for progress reports and institutional training grant applications. Initially, xTRACT will support the following training grant award mechanisms: T32, TL1, T90/R90, and T15 for both progress reports and grant applications. NOTE: xTRACT can be used on a pilot basis for creating data tables for those mechanisms for Research Performance Progress Reports due Dec. 1, 2015 or later and applications submitted for the May 25, 2016 due date and after (See Guide Notice NOT-OD-16-007). For details, please see the latest eRA Commons Release Notes. Federated Login is the ability for users to use their institutional user ID and password to access eRA Commons. This functionality has now been expanded to include users with the ASST role in eRA Commons. This option is for organizations currently registered with InCommon and who work with NIH’s Center for Information Technology (CIT) to establish the relationship between your institution and eRA Commons. For more information on the Institution/Organization Log In functionality, review the October 17 Commons Release Notes, or the Commons Online Help System. This is an increase from the previous 90 days for all final reports as part of the Closeout process (see video tutorial) and Uniform Guidance. Reminders for fellowship terminations are sent 30 days prior to the project end date, 1 day after the project end date, and 30 days after the project end date. These fellowship notifications will be viewable by the grantee on the Status Information screen. NOTE: These notifications for National Cancer Institute (NCI) fellowships will not be available in Grant Folder until September 2015. Termination Reminder notifications were sent when there was a future reappointment in an Accepted status. Termination Reminder notifications were sent thirty days after the appointment end date stating that there was thirty days left before the appointment end date. The notification should have stated that thirty days had passed since the appointment end date. Multiple Termination Reminder notifications were sent for the same grant applications. The U.S. Department of Health and Human Services (HHS) has issued a directive to Agencies on new policies for closeout of grant awards. NIH has revised its policies and procedures to align with the OER Policy Announcement 2014 regarding the guidance on implementation of HHS GPAM Chapter 1101 (Closeout), including Unilateral Closeout. As a result of this directive, the Status Closeout screens have been modified. Two new statuses have been added to the Closeout Status search parameter on the Closeout Status search screen to limit search results to these grants. The Status Result – Closeout Search screen will include the following links for grants unilaterally closed or in the process of being unilaterally closed. The links open the Closeout Status screen. In FCOI Module, Grantees can no longer initiate Financial Conflict of Interest reports for Administrative Supplements. You may be receiving this email communication since the FCOI official originally responsible for this FCOI report appears to be no longer affiliated with your organization or does not currently have the FCOI role. Therefore, please forward this communication to the appropriate FCOI official within your institution that is currently responsible for reporting identified FCOIs to the Agency. Principal Investigators (PIs) logged in as Federated users will see the same features and modules in Commons as they do when logged in with Commons credentials. The Office of Lab Animal Welfare (OLAW) and eRA are collaborating to improve the capture and validation of Animal Welfare Assurance Numbers. The Institution Profile in Commons has been modified to support this collaboration. Institutions are no longer able to add or edit the Animal Welfare Assurance Number field. This field, located within the About the Institution panel of the Institution Basic Information screen, will display all assurance numbers for the institution as passed to Commons from OLAW system. The Just in Time (JIT) screen has been modified to allow the upload of an Institutional Certification for Genome Data Sharing. PIs can now recall Termination Notices (TN) at any time, regardless of the current reviewer, as long as the TN has not been submitted to the Agency. Grant numbers within all xTrain communications now include the grant extension number (e.g., 01A1) if one exists. In the January system-wide release, a free text field was added to the No Cost Extension form as a place for grantees to provide justification for the extension as required under HHS Uniform Guidance. For this release, the field has been removed to provide time for the development of a more elegant and user friendly option for meeting this requirement. Added a direct cost limit calculation to the application image, so users can determine if their application falls within any direct cost limits of a Funding Opportunity Announcement. NIH will be requiring an explanation for grantee-initiated extensions be provided in a new 2000 character limited text box, when requesting a No Cost Extension. The text box will make it easier and more convenient to provide justification for the extension. A change to your Social Security Number, Date of Birth, or Contact Email Address will trigger a confirmation message to the original email address, alerting you to the change of information. When changing either the Social Security Number or Date of Birth, the system will display a pop-up window confirming that you want to make the change. Project titles can now support scientific characters such as Greek letters and/or mathematical symbols. However, while eRA Commons will support the use of these characters, it will not be until February 2015 that Grants.gov will complete its systems upgrade to support these characters. Please look for an upcoming Guide Notice for more information. On the Institution Profile form, under Institution Contact Information, there will now be a new required field for Closeout Correspondence Email. For existing institutions, the Notice of Award Email address will be automatically copied to the Closeout Correspondence Email field until it can be updated. For closeout related roles (AO, PI and SO), emails sent to these users will also be CC’d to the Closeout Correspondence Email. Federal Financial Reports will require comments when a revision is submitted. Final Progress Report (FPR) submission can be delegated and for existing users with the RPPR submission delegation, the FPR submission delegation will be added automatically. For complex (multi-project) applications, the new PHS Additional Indirect Costs form will be available for projects with an Overall Component and at least one subcomponent. A new status for fellowships has been added: Proxy Termination. When a Proxy Termination is accepted by agency for a non-fellowship appointment, the status will now be displayed as Proxy Termination. The Business Official (BO) will now have the ability to modify the stipend amount. However, this is only available when the appointment period has been modified. Reminders sent to Principal Investigators (PIs) for trainee terminations will be sent 30 days prior, one day after and 30 days after the termination date. Automatic termination of trainees for accepted appointments prior to January 1, 2011. In an effort to clean up legacy data, the system will automatically terminate appointments that were accepted by an institution prior to January 1, 2011. The “Reset to Prior State” option will not be available for these appointments. If you need assistance for an appointment that gets terminated as a result of this process, please contact the Help Desk. User will now be able to leave comments/text for question # 5 (Retrospective Review Completed? N/Y) on the original FCOI report. Comments will be visible to Agency users. This is just a sampling of the features being rolled out for this release and will be available Thursday, November 7, 2013; detailed information can be found in the Release Notes. The following are highlights of eRA’s upcoming October 18-19 system-wide software release. The use of RPPR is extended to all SNAP eligible progress reports and all Fellowships (F activity codes). For more information about RPPR, please visit the Research Performance Progress Report (RPPR) web page. The Progress Report Additional Materials (PRAM) feature provides a means for the grantee to enter, review, and submit information in response to specific request(s) from NIH for additional materials or in response to non-compliant publications following the submission of an RPPR. A new status screen for Principal Investigators (PIs) will be included in the release. The new interface will be more consistent with the screen Signing Officials see. It will let the PI see all errors and warnings from submissions even after the application has moved forward in the review process. Fixes the PDFs of xTrain appointments to ensure that important data and signatures are included. Enables the termination of appointments and fellowships when there is a change of institution. The name of the new institution, project title (if it has changed) and appropriate Business Official will be listed on the Termination Notice User Interface and PDF. In the near future, PDFs of xTrain appointments that are missing important data and signatures will be regenerated with all the correct information. Electronic submission of Change of Institution (Type 7) applications – This process allows an institution to turn over an active grant to another institution. It is an open pilot, meaning that you have the choice to use the electronic process or the traditional paper process. There are two parts to the Change of Institution submission. The institution holding the grant must complete a Relinquishing Statement through eRA Commons that states it is giving up the grant and identifies the receiving institution. The receiving institution must submit an application via Grants.gov using the Parent Funding Opportunity Announcement listed at http://grants.nih.gov/grants/guide/parent_announcements.htm. Electronic submission of Successor-in-Interest (Type 6) Applications – Also in an open pilot, this process is similar to Change of Institution (Type 7) Applications. It applies in cases where an organization is taken over by another organization through a merger or corporate change. Please look for an NIH Guide Notice next week. Research Performance Progress Report (RPPR) – The RPPR was sparked by a federal mandate to create a progress report in a standard format across federal agencies so that recipient reporting is standardized. The RPPR begins as a limited pilot, with seven institutions volunteering to test the procedures. We anticipate a wider pilot over the summer and going to full production in 2013. Additional information can be found on the Research Performance Progress Report Web page and NIH Guide Notice NOT-OD-12-083. Various fixes for the Administrative Supplement (Type 3) system which is currently in open pilot. A fix for users experiencing difficulties in adding the role type of “Other” to the All Personnel section of the eSNAP. As you may be aware, NIH is piloting two programs for the electronic submission of administrative supplement (non-competing Type 3) requests, one through a "streamlined system" in the eRA Commons and one through Grants.gov for the benefit of researchers at system-to-system institutions. The open pilot programs will begin on February 1, 2012 (See NIH Guide Notice NOT-OD-12-024). eRA implemented changes to provide grantees the ability to create, edit, and submit an electronic version of the administrative supplement request using the eRA Commons. Whether submitted through the eRA Commons or through the Grants.gov portal, users will be able to track the administrative supplement requests in eRA Commons.